The first great war of Ovira is over and the most hated king in centuries is dead, but his nephew still lives. However, Basen had nothing to do with the destructive war his uncle started. In fact, it was his uncle who exiled him and his father to the territory of their enemies, where Basen’s dreams of becoming a legendary mage now fade as he must work all day just to eat. His only chance at regaining some semblance of the life he thought he would lead is to join an elite school that trains, houses, and feeds a thousand new young men and women each year. But little does Basen know that his determination will put him at the center of a war even bloodier than the one he’d barely managed to avoid. Great book, with a ending that leaves you wanting more. I have absolutely loved all of B.T. Narro's books regarding all the characters linked with this story. I cannot get enough of them all and can only hope the Author would write another Trilogy connecting all the characters again. One of the best series I have ever read. Start with any of the B.T Narro series because they all link together and it works perfectly! This is a great story full of intrigue. With beloved characters and new ones. Set in a fantastic world that has depth. Can't wait to read more. Having not read the previous series, this series did a decent job of letting the reader sense the surrounding world, but not trying to shove it all into the reader's throat at once. For that I give the author some props. However, in many other aspects, this really was a poorly written book. Sentences are fairly blocky and not eloquent. The information needed to be communicated is there, but it's at times like reading a research paper more than a fantasy novel. For those with a strong imagination this works, but if you don't have one then I think it's an issue. I was ready to buy book 2, but the ending of 1 stopped me: The author attempted to create this great "reveal" that comes off horribly. It is a case of explaining away all the secrets of the bad guy in the hopes of showing to the reader how evil said bad guy is. The problem is that in one fell swoop the tension was cut, the reasons given were so very poor that even the character acknowledged they didn't make sense. The author broke the fourth wall in a way by switching story modes in such a way and I have no interest in continuing the tale because what could have been a truly great mystery has been turned into a case of "character B is effectively insane so he/she is going to try and kill character A"
Finally, the manner the relationships are treated in the story seems fairly juvenile-ey done. While I am not exactly a Casanova, the reactions of all characters to their opposite sexes make very little sense with very little reason. The author tries to excuse this at times by implying that the main character is especially "beautiful", but this seems to translate into a sudden passionate desire vs a normal sense of attraction or at most lust. With an intricate, action-filled plot, in which mystery and twists are seamlessly woven, it was hard to put this book down. Basen, the nephew of a hated king recently killed for his crimes, has to carve out a life for himself in a foreign land full of people who despise his family. But the story doesn't dwell on him being rejected. You'll find no whining in this book. It jumps into the plot quickly: the Academy and the conflicts surrounding it. Basen has high hopes for himself, and the skills and charm for his determination to pay off, but the world he's in is brutal, setting him up for the challenge of his life. The characters have all earned their place in the story by having their own goals and determination, making them seem very realistic. The story is ultimately about Basen, but I really got a feel for what life is like for nearly all the characters as well as a good notion of the world they live in. I can't wait to see what happens next. I decided to buy this book and I really love this series. I have now purchased all five of the series. I read several of the books in one evening, can't put them down. 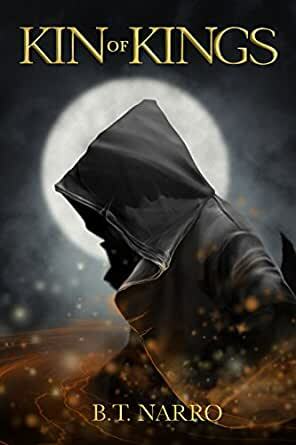 Really good if you enjoy a fantasy type series. Good characters that leave you wanting more after each book. Glad the series was finished when I ran across it. Last one I purchased I discovered the author had not yet completed the last two books and I had to wait about two years to finished the series. This one is done so you can finish them all! Great Book!! I felt like it was a cross between Game of thrones, Harry Potter and World of Warcraft.If you like any of those you should give this a try. I loved the charterers and was surprised at some of the things that end up happening to some of them. The ending leaves you wanting more. You do not need to start from the first series. I didn`t and read this without feeling like I was missing anything. Battles good, murder, escape, castle intrigue, and a twist that has not been in other stories. No spoilers here. So the moral dilemma is going to be resolved. Just about when I thought there was an answer, the story ended. I really like this author and his style of writing. Basen is not that strong of a leader as his character is flawed and makes him more endearing and life like. Effie and the potion she took, added a human look at feelings/how we are affected by them. There is alot to the story. I sat down to read this book and couldn't put it down, I read it in one sitting! Great reading everyone.